Patent Granted by King Henry VII to John Cabot and his Sons, March 1496. Reproduced from H.P. Biggar, ed., The Precursors of Jacques Cartier 1497-1534: A Collection of Documents relating to the Early History of the Dominion of Canada (Ottawa: Government Printing Bureau 1911) 7-10. Original document housed in the Public Record Office, London. 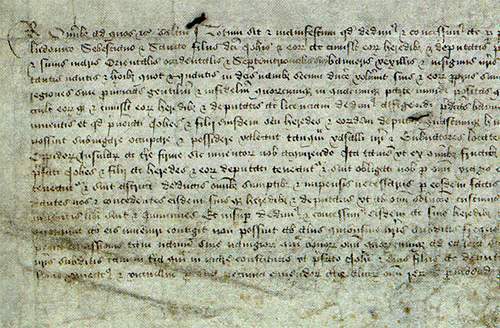 By this public document, Henry VII indicated his official, royal support for Cabot's enterprise. As an agent of the English Crown, Cabot was empowered to investigate, claim and possess lands "which before this time were unknown to all Christians" - which meant he could not intrude on Spanish and Portuguese discoveries. The king would receive one fifth of the value of merchandise brought back to Bristol, though he had invested no money of his own. On 5 March 1496, King Henry VII granted a letters patent to John Cabot and his sons. This permitted them to investigate, claim and possess any new lands so long as they did not intrude on Spanish or Portuguese territories. From André Vachon, in collaboration with Victorin Chabot and André Desrosiers, Dreams of Empire: Canada before 1700, Records of Our History series, English transl. by John F. Flinn (Ottawa, Ontario: Public Archives of Canada, ©1982) 23. Plate 7. Courtesy of Public Records Office, London, England: Chancery, Warrants for the Great Seal, Series II, C 82/146, no. 6. For John Cabot and his Sons. The King, to all to whom, etc. Greeting: Be it known and made manifest that we have given and granted as by these presents we give and grant, for us and our heirs, to our well beloved John Cabot, citizen of Venice, and to Lewis, Sebastian and Sancio, sons of the said John, and to the heirs and deputies of them, and of any one of them, full and free authority, faculty and power to sail to all parts, regions and coasts of the eastern, western and northern sea, under our banners, flags and ensigns, with five ships or vessels of whatsoever burden and quality they may be, and with so many and such mariners and men as they may wish to take with them in the said ships, at their own proper costs and charges, to find, discover and investigate whatsoever islands, countries, regions or provinces of heathens and infidels, in whatsoever part of the world placed, which before this time were unknown to all Christians. We have also granted to them and to any of them, and to the heirs and deputies of them and of any one of them, and have given licence to set up our aforesaid banners and ensigns in any town, city, castle, island or mainland whatsoever, newly found by them. And that the before-mentioned John and his sons or their heirs and deputies may conquer, occupy and possess whatsoever such towns, castles, cities and islands by them thus discovered that they may be able to conquer, occupy and possess, as our vassals and governors lieutenants and deputies therein, acquiring for us the dominion, title and jurisdiction of the same towns, castles, cities, islands and mainlands so discovered; in such a way nevertheless that of all the fruits, profits, emoluments, commodities, gains and revenues accruing from this voyage, the said John and sons and their heirs and deputies shall be bound and under obligation for their every voyage, as often as they shall arrive at our port of Bristol, at which they are bound and holden only to arrive, all necessary charges and expenses incurred by them having been deducted, to pay to us, either in goods or money, the fifth part of the whole capital gained, we giving and granting to them and to their heirs and deputies, that they shall be free and exempt from all payment of customs on all and singular the goods and merchandise that they may bring back with them from those places thus newly discovered. And further we have given and granted to them and to their heirs and deputies, that all mainlands, islands, towns, cities, castles and other places whatsoever discovered by them, however numerous they may happen to be, may not be frequented or visited by any other subjects of ours whatsoever without the licence of the aforesaid John and his sons and of their deputies, on pain of the loss as well of the ships or vessels daring to sail to these places discovered, as of all goods whatsoever. Willing and strictly commanding all and singular our subjects as well by land as by sea, that they shall render good assistance to the aforesaid John and his sons and deputies, and that they shall give them all their favour and help as well in fitting out the ships or vessels as in buying stores and provisions with their money and in providing the other things which they must take with them on the said voyage. Witness ourself at Westminster on the fifth day of March. By the King himself, etc.